Orion test launch success: Will the Space Launch System succeed for crewed flight? But is Orion really taking us in the right direction? The United Launch Alliance Delta 4 rocket carrying NASA’s first Orion deep space exploration craft takes off from its launchpad on Dec. 5, 2014 in Cape Canaveral, Florida. 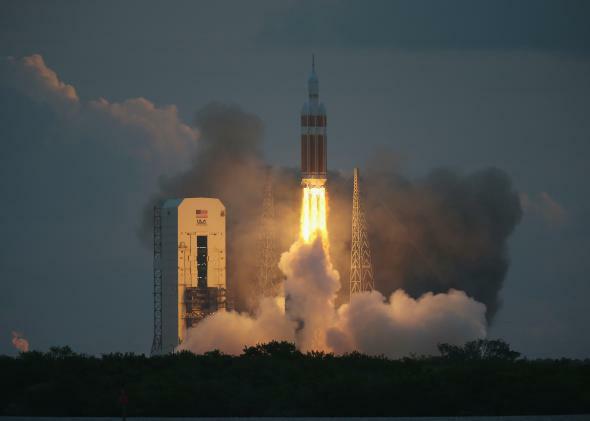 On Friday, Dec. 5, 2014, NASA launched the Orion Multi-Purpose Crew Vehicle into space. Orion made two looping orbits around our planet and then splashed down in the Pacific Ocean, completing what looks to have been a nearly flawless mission. NASA is heralding it as the first big step toward exploring the Moon and Mars, testing out several of the systems needed to get humans into space and bring them back safely again. Without context, Orion sounds like a great idea. NASA hasn’t had the capability to put people in space since the last Space Shuttle landed in 2011, and it hasn’t been able to put a human beyond low-Earth orbit since the 1970s. The Orion capsule can return us to deeper space once again. When attached to the proposed European Service Module, it’s capable of a 21-day mission—more than enough to get to the Moon and back—and a proposed Deep Space Habitat module can extend that mission duration enough to get to Mars. Together with NASA’s Space Launch System (or SLS), the most powerful rocket ever built, Orion could be our ticket to the solar system. This idea lights up a lot of the space-nut parts of my brain. Sending people back to the Moon, this time to stay! Building a base there, exploring near-Earth asteroids, then going to Mars! Mars! But there’s another part of my brain, the skeptical part. It’s holding on tight to the reins, and it’s pulling back hard. As much as I love the idea of getting humans off this planet and into space, we have to be realistic, and we have to look at the cold, hard practicalities. I won’t go into the necessity of space exploration; I have argued for it over and again, and in my mind the case is made. We need to break the bonds of Earth. The question is, how are we going to do it? NASA wants to use Orion, and they want to launch it on the SLS. I have some problems with this. In 2004, President Bush announced the Space Shuttle program would end once the International Space Station assembly was completed. He also announced a new rocket system, Constellation, which would replace it. Constellation would have rockets more like the old Apollo Saturn V: big boosters capable of flinging huge payloads beyond Earth orbit. However, by 2009, Constellation was in trouble. The Augustine Committee, commissioned by President Obama, found that the program was underfunded, over budget, and well behind schedule. Obama (rightly) canceled it, and the Space Launch System was born to replace it. SLS, as planned, would be the most powerful rocket ever built, capable of sending Orion and its accouterments out of Earth orbit. But things aren’t going as planned. SLS is behind schedule; the first launch, originally planned for 2017, has already slipped a year, into 2018. This doesn’t surprise me at all, and in fact I predicted it. NASA, as fantastic an agency as it is, has a history of being behind schedule on big projects, including the Shuttle, the Hubble Space Telescope, the James Webb Space Telescope, and the now-canceled Constellation. The problem isn’t NASA per se, but that it’s a government agency. It has to dance with both Congress and the White House, and they can be recalcitrant partners. Once a project gets big enough, for example, special interests chime in. Senators and Representatives look to help out their own states and districts by adding layers of bureaucracy and pork to the projects, then protect whatever they get. Also, the White House and Capitol Hill don’t always agree on what’s needed or how to get there, adding more confusion, and the inevitable sparring over the annual NASA budget tends to make things worse. That seems to be the case with SLS now. Five years after the Augustine report, SLS is still not being funded at a sustainable level. There’s plenty of blame to go around for it being underfunded—and fingers have been pointed—but the bottom line is that NASA has a capped and relatively flat budget every year. This in turn means the agency sometimes has to rob Peter to pay Paul, and that means SLS will start eating away at the funds for other projects. I have long said the answer to this is easy: Increase NASA’s budget. It gets about half a percent of the federal budget, yet does an incredible amount with it (Cassini, Dawn, Swift … and those are just astrophysics missions; there are dozens more examples of NASA’s abilities). Doubling the agency’s budget—getting it to a nice round 1 percent of the federal budget—would free it up to do what the White House and Congress want. Coupled with better regulation of projects, but less outright interference from lawmakers, NASA could be blazing the way across the solar system. Realistically, though, that’s pretty unlikely to happen. A flat budget and an ever-hungrier and already huge SLS/Orion project is a plan for disaster … and there are many space insiders who think it may be time to bring out the axe. Suppose a miracle occurs, and NASA gets more funding. Even then, I’m not sure it makes sense to continue with SLS and Orion. Right now, for example, SpaceX is doing pretty well with its Falcon 9 rocket. The F9 is capable of getting a decent payload to orbit, and has already had several successful missions to resupply the International Space Station using the SpaceX Dragon space capsule. Elon Musk has revealed plans for the next generation Dragon V2, which is much larger and can carry more astronauts and supplies. SpaceX is also well on its way to building the Falcon Heavy, the next step up from the F9. It will have more lift capability than any rocket currently existing, though to be fair, less than what is proposed for SLS. That last part seems important. If you want to go to Mars, won’t you need a much more powerful rocket—that is, the SLS? You do if you want to send up huge chunks of hardware all at once. But if you can subdivide, you can send up that same equipment over multiple flights. That sounds like it’s more expensive … except that a Falcon Heavy launch will cost a fraction of what the SLS will. You can launch several Falcon Heavys for the price of one SLS. And Musk has said that SpaceX can build a super heavy launcher that will exceed the payload capability of SLS as well, yet still cost far less. And that’s just SpaceX. There are other companies at various degrees of development with an eye towards this capability. SpaceX is simply the current leader. Do we even need the SLS? Lori Garver doesn’t think so. She would know: She’s the former deputy administrator of NASA, and she’s very critical of SLS. Also, if we build it, it’ll be so expensive there won’t be any money left over to build the actual payloads it’s designed to carry (Joel Achenbach’s gumbo analogy is an excellent one). Critics have nicknamed the SLS the “Rocket to Nowhere” for this reason. No less a figure than Chris Kraft—NASA’s legendary first manned spaceflight director—has also been pretty clear he’s not a fan of SLS. Several members of the Augustine Committee are skeptical as well. If SLS is scrapped, then Orion’s future is questionable. Orion is designed with SLS in mind. A Falcon Heavy could technically loft one, but there would need to be redesigns done to the rocket to make it a viable option for deep space missions. But even then, it’s not clear why Orion should be built. Musk has made it clear he’s serious about continuing to build bigger rockets and capsules capable of taking humans on deep missions, and he’s shown pretty well he can come through with his boasts. SpaceX has already launched several Dragon capsules, and the Dragon V2 should be ready to go long before Orion. We can afford to build and launch many missions using SpaceX if SLS and Orion are simply scrapped and the money redirected. NASA could even participate in the design process of advanced capsules. In a sense, NASA has taken a step in that direction with the Commercial Orbital Transportation Services contract, giving money to private companies to service the space station. It seems a logical step to expand that into the bigger role of exploration. When I was a kid, NASA was a synonym for getting things done. The agency put men on the Moon, and the future looked like an Arthur C. Clarke novel. I think about that term, and my heart sinks. NASA should not be in the trucking business. The purpose of our space agency should be to innovate, to imagine, to do things only a heavily supported government agency can do. It should pave the road, and then once that path is cleared, let private companies do the trucking. That’s what the Commercial Orbital Transportation Services project is for and it’s a great idea; it saves the taxpayers a lot of money at the very least. And while NASA is working on ways to improve our ability to explore deep space—more efficient engines, better recycling of materials, and simple raw experience of working in space—my worry is that SLS and Orion are just bigger trucks. I’ll be honest: Private space travel is still young. There are a lot of bumps in the road ahead, no doubt, lots of new ideas and new tech that need to be tested before implemented. Only SpaceX and Orbital Science Corporation have gone to the space station, and only SpaceX has made solid progress to getting humans in space—but SpaceX still needs to prove it can do it. But then, so does Orion. And no matter how you slice it, Musk is far more likely to get humans into space before NASA can. The human-rated Dragon should be ready to fly its first test mission in a few months, and SpaceX claims it will be ready to fly humans in two to three years. That’s before SLS is even ready to fly an uncrewed mission. Realistically, it’ll be 2021 at least before SLS will have humans on board, barring any more delays. As I watched the Orion flight, it was with gravely mixed emotions. It was amazing, to be sure, but it was also the first step of a very expensive trip that might just be taking us down the wrong road.